I am a Sponsor. What should I expect on event day? We thank all our sponsors for supporting this wonderful event. A special sponsorship desk will be setup at the venue. Please check in at the Sponsorship desk to collect your tickets and VIP Badge. The Sponsorship desk will provide you with all the assistance you need on event day. Yes – but there are very limited slots available. All children who are over 2 years of age, and who cannot sit on the lap of the parent, need a ticket for the show. If you have not already purchased a child care ticket online, We have VERY LIMITED SLOTS available for ON SITE child care. Please arrive by 3 PM to ensure a slot. There is no guarantee that you will get a slot – because we have very limited slots available, and they will be allocated on a first come first served basis. You can collect your DVDs from the special counter that will be setup on event day. What is the detailed Event Schedule? Please remember to dress in layers. It can get cold in late October in Hayward. Yes. We are pleased to have Chaat Bhavan as our food sponsor for Google Gadothgajan. The Food Distribution Square will be setup just outside the entrance of the auditorium. NOTE: There will be a 30 minute break between around 6:30 PM and 7:00 PM. Keep in mind, the break will be very short because the artists do not like to have too long a break. 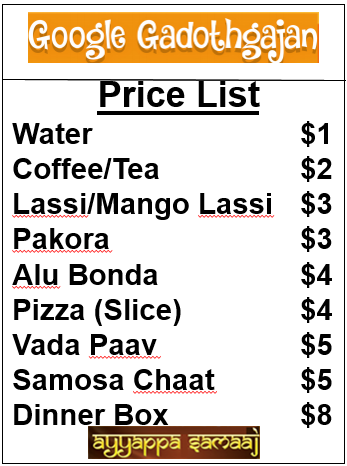 The following table lists the prices for the items on event day. Please bring exact change to speed up the process of paying for the items. You can also pay by credit card. Thanks to all the patrons who have purchased online food orders. For your convenience, we are setting up a Quick Access booth for you to collect your food tokens and food on event day. If you have already picked up your drama ticket, you can collect your food coupons at the Special Quick Access counter that is being setup for your convenience. Please look for signs to the Online Food Order Signs to get your food orders. From Highway 880 North or South take the Jackson St / San Mateo Bridge Hwy92 off-ramp heading West towards the San Mateo Bridge. Take the first off-ramp, HESPERIAN Blvd and take the LEFT exit (North). As you exit stay in the far left lane and make a left at the first light onto DEPOT Road. You may now make a right and park in Parking lot G and follow signs to the PAC (Theater). From the Peninsula / Hwy 101, 280, take Hwy92 San Mateo / Hayward Bridge East to Hayward. Exit at HESPERIAN Blvd and turn left at the light. Proceed over the overpass, make a left at the first light onto DEPOT Rd. and then turn right into parking lots G.
Remember to pay the Parking fee ($2) to pay the Parking fee at the Parking Machine. Why are we announcing advance food purchase? As you may have noticed, all of our tickets for the drama have been sold – meaning we have a full house with 1400+ patrons. With so many patrons, we are expecting huge lines in the food coupon sales and distribution area. In order to manage the long lines, we are selling food coupon tickets online at a discounted price. Many patrons have already taken advantage of this advance purchase option. People who avail this will have a separate fulfillment station on event day and shorter lines. If you have purchased child care tickets, please bring your child to the Child Care Center that is located near the entrance of the auditorium. We will have experienced child care professionals from Safari Kid taking care of your child. Please email us your child’s name and age so we can have this information provided to the child care center. Thanks to Safari Kid (408) 600-6031 and their caring, professional team for joining this event, and providing child care, ONSITE! You now can register your children for child-care, and watch the drama with peace of mind, knowing that your children are just steps away from you, and being well-taken care of! We really have limited space, so please buy your child care ticket NOW!! Also note, all proceeds from child care will be donated to Community Seva, the local non-profit that supports the needy in the San Francisco Bay Area!